Freedom-loving Aquarians can only be on their best behaviour and toe the line for so long. So expect the unexpected this week, when the Sun and Uranus stir up your restless (and reckless) side. You’ll balk at restrictions being placed on you by others (especially at home) but resist the urge to be a disruptive influence. Aim to be smart and selective as you fulfil your basic responsibilities … then go off and do something exciting and eccentric somewhere else! 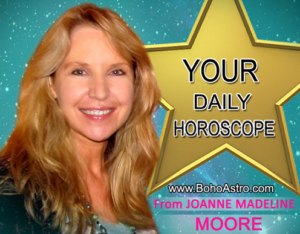 Over the past 20 years, Joanne has written regular columns for CLEO and The Australian Women’s Weekly, and her daily and weekly horoscopes are currently syndicated in 25 newspapers and magazines in Australia, New Zealand, Asia and the South Pacific [including The West Australian and The New Zealand Herald]. Her New Year and New Financial Year Horoscopes are also published each year in newspapers around the country [including the Melbourne Herald Sun and the Sydney Daily Telegraph]. 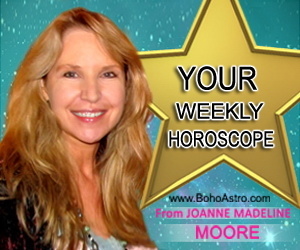 Joanne’s Moore Weekly Stars are published at Australian Women Online every Sunday.